Four short films on growing up in the 1970s are being released today as a tribute to citizens from the Merdeka Generation who helped to shape post-independence Singapore. They will be shown in cinemas before movies, on the Gov.sg YouTube channel and on free-to-air television. In one, a schoolgirl with a promising future is forced to leave school early so that she can help supplement her family's income. In another, a young man listens to his grandfather recount his experience of being one of the first to perform national service. Each three-minute film was directed by a local filmmaker, and touches on themes like resilience, sacrifice and the kampung spirit. Prime Minister Lee Hsien Loong first used the term "Merdeka Generation" during his National Day Rally speech last year to refer to some 500,000 Singaporeans born in the 1950s. He was announcing a new multi-billion-dollar package - dubbed the Merdeka Generation Package - to help this group with their healthcare needs. All four short films - known collectively as The Merdeka Stories - were written by playwright Jean Tay, who has written more than 20 plays and musicals, and was also the scriptwriter for two National Day parades. They were directed by Mr Don Aravind, Mr Martin Hong, Ms Priscilla Ang Geck Geck and Ms Wee Li Lin. The films are being launched by media group mm2 Entertainment in collaboration with the Ministry of Communications and Information. During a media preview yesterday, Ms Tay said that one of the challenges in writing the films was having to tell a complete story within a three-minute timeframe. "Even within that short space of time, you can see that the characters have gone on a journey," she said. "It's part of the craft of it." 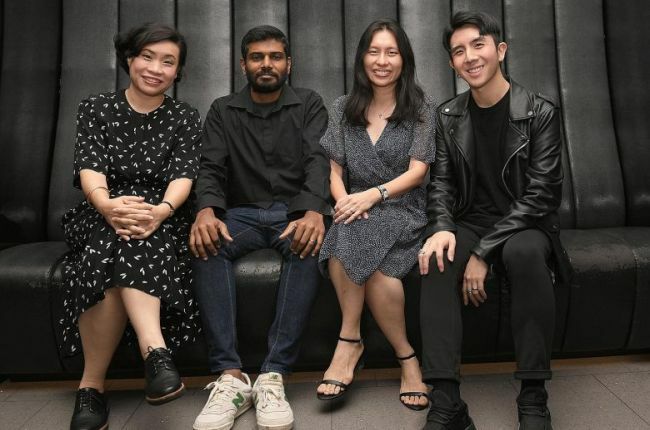 Mr Aravind, who worked on long-running Mediacorp drama Tanglin, said key elements in his short film were inspired by the experiences of his parents, both of whom are from the Merdeka Generation. "I referred back to a lot of the stories my parents used to tell me, about how my father used to woo my mother," Mr Aravind said. His film focuses on a young Indian man who must try to win the approval of his Chinese girlfriend's father. Ms Ang added that working on her piece - about a young girl who helps her mother sell home-made kueh door to door - helped her learn new things about her own family. "I learnt a lot about my own relatives whom I never get a chance to speak much to," she said. "My grandfather and my aunties had a lot of fun sharing their past stories." The films are a lead-up to an event this Saturday, when Prime Minister Lee Hsien Loong will be hosting a tribute to the Merdeka Generation. A separate seven-part documentary series on this group has also been launched.